The first Wednesday of September each year is Battle for Australia Day. It commemorates all of the battles, great and small, fought against Japan by the United States and Australia, to repel Japanese aggression. Bob Wurth’s book, the Battle for Australia, is a gripping account of that perilous time in Australia’s history. As our Governor-General of Australia wrote in the Foreword, it fills an important gap in our knowledge of that critical period for, 70 years after the bombing of Darwin and the invasion of New Guinea, we are still learning about what happened and just how beleaguered Australia really was – to an extent which was certainly not fully disclosed at the time, for fear of causing panic. 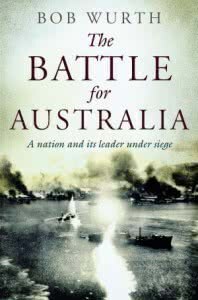 The sub-title to the book, “A nation and its leader under siege”, is very apt; for this book is not only a fascinating account of the military history of the war in the Pacific, when Australia truly was “under siege”; but it is also an insightful political biography of Australia’s war time Prime Minister John Curtin. He too, was “under siege”, as Bob Wurth makes clear. The John Curtin Prime Ministerial Library is therefore a very fitting venue for the launch of this book, which not only points out Curtin’s achievements, but also his frailties, flaws and failings. This is Bob Wurth’s fifth non-fiction book about the Asia Pacific region. He was this library’s visiting Scholar in 2009, and in November that year he helped to create the Library web resource and travelling exhibition, called “Menzies Fadden Curtin and the Japanese Envoy”. As might be expected from an author of his background and experience this, his latest book, is not only extremely well written, in a very readable style; it is also the result of deep research, carried out in Australia, Britain and Japan, which has produced a great deal of hitherto unpublished material. The very full Notes at the end of the book bear witness to what his very thorough research uncovered. As Major General Gordon Maitland, a war historian, has observed “All Australians owe it to themselves to read (this book) which gives a full and balanced story of those war years, a story quite different from that foisted on Australia over the last 70 years”. Both before and during the war years, Curtin suffered from severe depression. Before October 1941, when he came to power, the cream of Australia’s armed forces had been sent overseas in the service of Great Britain in the war against Germany. After Japan entered the war in 1941, it was only after a series of clashes of will between Curtin and British Prime Minister Winston Churchill that, ultimately, Australia’s experienced and seasoned soldiers of the AIF’s 7th Division were returned from overseas to help defend Australia against Japanese invasion, coming to the aid of young, almost untrained but brave young soldiers fighting to stem the Japanese advance towards Port Moresby over the Kokoda Track. Churchill strongly resisted the return of the 7th Division and contemptuously dismissed Curtin’s fear of Japanese invasion. He said that the war against Japan was “a lesser war” and it was only in a private conversation with King George VI that he conceded that parts of Australia might fall into enemy hands; as he also told a secret session of British Parliament, in a statement which he directed should not be recorded in Hansard, and which he kept from Curtin. This clash of will was between two leaders who both suffered from depression, the “black dog”, as Churchill described it. Curtin’s depression, and the impact it had on him, is brought home starkly by his extraordinary conduct on the 21 January 1942. The Australian mandated territory of Rabaul, where 1400 members of Australia’s inexperienced Lark Force were garrisoned, was about to the invaded by a large Japanese invasion force supported by aircraft carriers. Acting on doctor’s orders, and on the advice of senior Cabinet colleagues, Curtin left Defence Headquarters in Melbourne, and began a slow train journey across Australia to his family home at Cottesloe, Western Australia. As Rebaul fell to the Japanese two days later, and the Australian forces were being overwhelmed and in full retreat, Curtin was stranded on his train by a wash-away on the Nullabor. One can only imagine his state of mind at that time, with severe depression, illness, and an overriding, understandable fear, that Australia would the next to be invaded by the Japanese relentless wave of conquest. The previous month, he had agreed with Australia’s armed forces chiefs that the inexperienced Lark Force should not be withdrawn from Rabaul, but remain to fight against the Japanese invasion. Lark Force was overrun and many were killed or taken prison. That decision, coupled with the imminent fall of Singapore, shattered his morale and led to a major decline in his health. Australia’s defences were shamefully weak at that time. The only fighter plane it had, the Wirraway, was shot out of the sky over Rabaul. It was no match for the Japanese Zeros. It had no tanks and was short 7000 rifles, so many troops were training with broomsticks. Most of Australia’s airmen were serving with the RAF in Europe. The RAN was small and scattered. So in early 1942, Australia was virtually defenceless. A lesser man than Curtin might well have crumbled under the heavy burdens and responsibilities that he faced. Depression was coupled with other health problems. A deeply conscientious and patriotic Australia leader, he had inherited an Australia totally unprepared for war. That was soon demonstrated when the Japanese bombed Darwin, Broome, Wyndham and other towns on the Western Coast and north Queensland. Indeed, those air strikes, and the apprehension of Japanese invasion, caused (as David Black would no doubt remember, like me) the construction of dugout air raid shelters in some of the Perth suburbs, and the evacuation by mothers with young children to the Darling Ranges – my first visit to Roleystone, as a 4 year old. Great Britain, on which Australia had always placed reliance, was not only failing to deliver any assistance, but was actively opposing the withdrawal of Australian forces from overseas to help defend Australia. The “impregnable fortress” so called, of Singapore had fallen and the Japanese sweep of conquest across the Pacific seemed unstoppable. At home, there were strikes by wharf labourers and other unionists, disrupting production and the loading of essential material, which provoked some of the Armed Forces to label them traitors. And he had a war cabinet which was far from united in policy. Curtin is shown in the book to have been a resolute leader of great courage, despite his infirmities and depression. Realising that Britain could not be relied upon to defend Australia, given its focus on defeating Nazi Germany, and Churchill’s contemptuous reference to the war in the Pacific as a “lesser war”, he turned to United States for Australia’s defence and salvation. The book depicts a close and co-operative relationship between Prime Minister Curtin and General Douglas McArthur, the Allied Supreme Commander, to whom Curtin handed virtual control of Australia’s armed forces. Bringing the well trained and experienced AIF 7th Division back to Australia from overseas was a bold and important decision by Curtin. The book describes how he so agonised over it that he spent every night walking about the grounds of the lodge in Canberra, unable to sleep until the safe return of the 7th Division in undefended troop ships across the Indian Ocean, where enemy submarines lurked. He knew that he was taking a great risk, but an even greater risk would have been not to bring them back, and leave it to the small force of young, inexperienced troops – “Chocko’s” or “Chocolate Soldiers” as they were derisively called – to attempt to hold back the Japanese advance to Port Morseby, an attempt doomed to fail. When those troop ships set sail for Australia, Churchill audaciously and high-handedly diverted the convoy northwards towards Burma, in effect daring Curtin to demand they turn back. Curtin took the “dare”. He did turn them back. There can be no doubt that, as the book records, the entry of the United States of America in the war was indeed the salvation of Australia. In particular, two great naval battles, the Battle of the Coral Sea and the Battle of Midway in 1942 were a turning point, the Midway success leading McArthur, when he met Curtin in Melbourne on 11 June 1942, to assert that the security of Australia was now assured – something of which Curtin was not yet convinced, at least publicly. One of the many revelations in this well researched book is the crucial and highly secret part played by the Allied code breakers in the Battle of the Coral Sea and later in the decisive Battle of Midway, in 1942. But to the astonishment and dismay of the US allies, shortly after that batrtle, Curtin openly disclosed to some Australian journalists that it was an intercepted Japanese code message that had enabled the US fleet to be in the right place at the right time to engage the Japanese fleet. In his memoir, retired US Admiral Leyton was scathing of what he saw to be an act of recklessness, one which made the chief of the US fleet reluctant to continue to provide secret decoded information to the Australians thereafter, lest it be made public. However, the point strongly made by Bob Wurth in his book, The Battle for Australia, is that despite Curtin’s ongoing mental and physical problems, and despite the military and political mistakes made during his Prime Ministership, Curtin was a patriotic leader determined to put the needs and views of Australia above all else. Perhaps the most important of his achievements was in asserting Australia’s paramount right to defend Australia first, something which may seem unquestionably obvious today, and in forming a close relationship and alliance with the USA, an alliance which has continued, and indeed strengthened, over the ensuing 70 years. I wholeheartedly commend this important book to you, and have great pleasure in officially launching it.